Great Lakes Dental Technologies (formerly Great Lakes Orthodontics) is pleased to congratulate its co-founder, Dr. Carl Gugino for receiving the prestigious Dawson Academy Lifetime Achievement Award in recognition of his significant contributions to the dental profession. The award was presented at the January 2019 Dawson Airway Symposium in Saint Petersburg, Florida. The Dawson Academy is a postgraduate educational and clinical research facility dedicated to the advancement of dentistry. Their faculty teaches the principles and skills necessary for the successful practice of complete, quality, predictable dentistry as practiced and taught by its founder, Dr. Peter E. Dawson. Dr. Gugino graduated in 1953 from the University of Buffalo School of Dentistry. 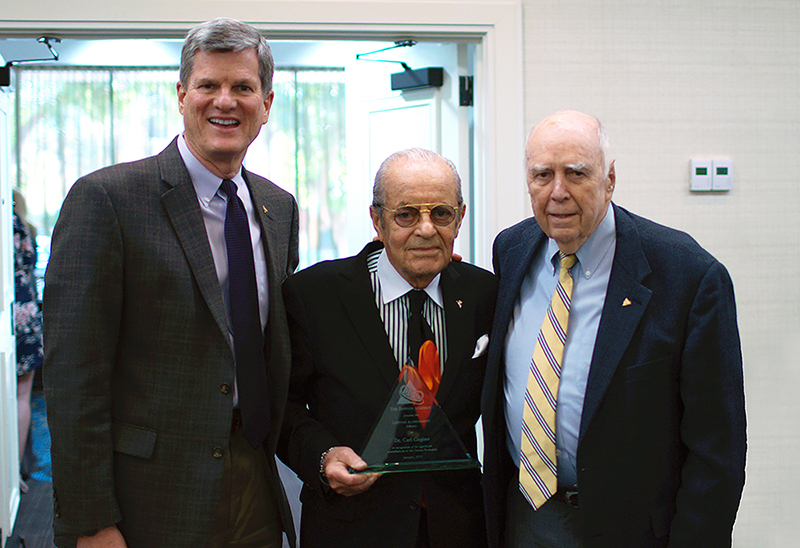 He established a local practice and eventually specialized in orthodontics in 1961. Dr. Gugino co-founded Great Lakes Orthodontics with Peter R. Breads in 1967. After years of expansion, the team eventually sold the company to its employees. Carl currently serves as a member of the Great Lakes Dental Technologies Board of Directors. He belongs to numerous American and European societies of orthodontists, has practiced orthodontics exclusively, and held lectures on this subject throughout the world. Carl is the author of the next generation Bioprogressive™ Philosophy, ZeroBase Orthodontics™ which combines treatment planning and diagnosis into time efficient treatments. Dr. Gugino also developed the first computerized cephalometric and visual treatment objective program available in orthodontics, and his patient management and teaching philosophies are used by practicing orthodontists around the globe. Congratulations on your award Carl - well deserved!